a. Climate is determined by the long-term pattern of temperature and precipitation averages and extremes at a location. Climate descriptions can refer to areas that are local, regional, or global in extent. Climate can be described for different time intervals, such as decades, years, seasons, months, or specific dates of the year. b. Climate is not the same thing as weather. Weather is the minute-by-minute variable condition of the atmosphere on a local scale. Climate is a conceptual description of an area's average weather conditions and the extent to which those conditions vary over long time intervals. c. Climate change is a significant and persistent change in an area's average climate conditions or their extremes. Seasonal variations and multi-year cycles (for example, the El Niño Southern Oscillation) that produce warm, cool, wet, or dry periods across different regions are a natural part of climate variability. They do not represent climate change. d. Scientific observations indicate that global climate has changed in the past, is changing now, and will change in the future. The magnitude and direction of this change is not the same at all locations on Earth. e. Based on evidence from tree rings, other natural records, and scientific observations made around the world, Earth's average temperature is now warmer than it has been for at least the past 1,300 years. Average temperatures have increased markedly in the past 50 years, especially in the North Polar Region. f. Natural processes driving Earth's long-term climate variability do not explain the rapid climate change observed in recent decades. The only explanation that is consistent with all available evidence is that human impacts are playing an increasing role in climate change. Future changes in climate may be rapid compared to historical changes. g. Natural processes that remove carbon dioxide from the atmosphere operate slowly when compared to the processes that are now adding it to the atmosphere. Thus, carbon dioxide introduced into the atmosphere today may remain there for a century or more. Other greenhouse gases, including some created by humans, may remain in the atmosphere for thousands of years. Climate changes for many reasons, and on many different time scales. These key ideas illustrate the differences between weather and climate and unravel some of the processes that cause natural climate variability, and abrupt climate change, and human-caused climate change. Understanding climate variability such as the El Niño/Southern Oscillation is critically important in helping scientists tease apart natural variation from human-induced climate change. In this principle the human impact on the climate through burning of fossil fuels is clearly differentiated from naturally occurring climate processes. 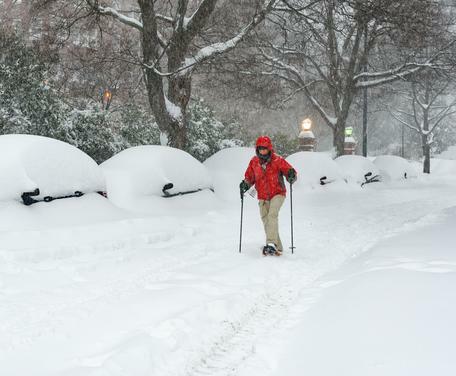 Aftermath of the January 2016 snowstorm in Washington DC. Photo by Alejandro Alvarez. Provenance: Photo by Alejandro Alvarez. Cropped from the original. Sharable under Creative Commons 4.0. Reuse: Sharable under Creative Commons 4.0. A spell of unusually cold or warm weather neither negates nor confirms human-caused climate change. Climate is defined as a long-term pattern with naturally occurring variability. The climate has changed throughout the history of Earth, to varying degrees, over different time periods and due to different causes. Human-caused warming is not the same thing as Earth's "natural" warming. Scientists use many lines of evidence to differentiate human-caused changes from natural cycles. Weather and climate can both vary to a large degree over very small distances. In a seemingly futile effort to extinguish the fire, a man uses a shovel. A helpful starting point is to establish the difference between weather and climate. Weather events occur over minutes to hours to weeks, while climate is a longer-term pattern that plays out over seasons, years and into millennia. Both can change abruptly, but the reasons for the changes are often very different. Understanding natural climatic processes that drive multi-year cycles (like the El Niño/Southern Oscillation) requires an understanding of basic climatic patterns and processes as well as feedback effects. Once students can appreciate the complexity of the climate system they will be able to understand that global warming doesn't necessarily result in warming at every location but that some (few) places might experience a net cooling despite the global trend of rising temperatures. Likewise, the occurrence of brief periods of cooling during a long-term trend of warming does not negate the fact that the climate is indeed warming. The single most common misconception in the public's understanding of climate change is that the climate has changed in the geologic past, which some people incorrectly extrapolate to mean that humans cannot affect the climate today. Regardless of a student's mastery of climate science in class, they are virtually guaranteed to encounter this misconception outside of class. Educators can be pro-active in developing a robust understanding of these concepts and reinforcing them with multiple types of learning activities. Many processes on Earth have more than one cause. 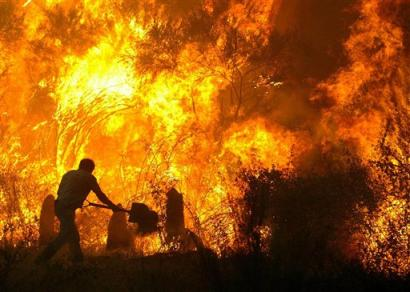 Forest fires occur naturally, yet they also can be caused by arson. The presence of a natural cause does not negate the reality of a human trigger. Throughout geologic history, we know that more greenhouse gases in the atmosphere equates to a warmer climate, regardless of the source of the greenhouse gases (from the ocean, from wildfires, from volcanoes, from melting permafrost, etc.). So as humans add CO2 and other greenhouse gases to the atmosphere, we know that it also has the same warming effect. The physical process is the same either way. A key difference between past climate changes and today's climate change is the rate of change. Today's warming is much more rapid that past shifts in climate. This makes it harder for ecosystems to adapt. Read the Skeptical Science rebuttal of this misconception. A related misconception is that humans cannot fix climate change. But if we know that the climate becomes warmer due to the addition of greenhouse gases, then we also know that adding less of them will reduce this effect. It is important to avoid a sense of hopelessness. These ideas are further discussed in Humans can take action, the guiding principle of climate literacy. Paleoclimate reconstruction showing the changes in ice cover over the Northern Hemisphere since the last ice age, 18,000 years ago. It can be difficult to describe processes that operate on different time scales. Specific strategies that can help students understand this are using visualizations and teaching with simulations. Both of these approaches allow students to "observe" a process at work and get an overview of complex processes and relevant feedback loops. A third concept that can enrich these ideas is to describe how scientific evidence can illuminate things that happened long ago. Scientific principles from geology, paleoclimatology, and atmospheric science have been used together to understand how climate systems have responded to changes on Earth in the past. Students can use their home turf to understand variations of the climate in this data collection activity, Differences Between Climate and Weather. Atmospheric CO2 at Mauna Loa Observatory illustrates current and historical data of atmospheric carbon dioxide from the late 1950s to the present. This web page always contains current data. In the activity Charting Temperature Changes, students use their data to create an interactive display illustrating how Antarctica's climate timeline can be interpreted from ANDRILL rock cores. Students receive data about tree ring records, solar activity, and volcanic eruptions to examine The Little Ice Age: Understanding Climate and Climate Change. Nobody explains climate better than Richard Alley. The video CO2 and the Atmosphere describes the multiple lines of evidence for the role of CO2 in Earth's climate system. The video The Difference Between Weather and Climate uses visuals and data from ice cover on a Wisconsin Lake to illustrate the point. The difference between natural and human-driven climate changes are illustrated in this video that uses a baseball analogy - Steroids, Baseball and Climate Change. The activity Normal Climate Patterns explores local climate data so that students can inform a pen pal what type of weather to expect during an upcoming visit. The topic of modern climate change is addressed by the video Is Earth Warming? and the activity Is Climate Change Happening? Climate Around the World offers a dynamic, poster-making approach to see how climate varies around the world. Could also be used in high school. What are the causes and effects of ENSO? - In this activity, students play the role of a policy maker in Peru to examine data and recommend actions. Students use Excel to compare carbon dioxide data from Mauna Loa Observatory, Barrow, Alaska, and the South Pole over the past 40 years in The Modern Atmospheric CO2 Record. Students can plot long-term climate data with Vostok Ice Core with Excel. NASA Website about Difference between Weather and Climate - Summary written for a lay audience and supported by some NASA graphs. NCAR Website about Difference between Weather and Climate- brief summary written for a lay audience. The Biggest Control Knob: Carbon Dioxide in Earth's History by Richard Alley, presented at AGU in 2009, this video steps viewers through the geologic evidence for the role of CO2 in driving Earth's climate. Dr. Alley is an engaging and entertaining speaker. What does past climate change tell us about global warming? This page from the Skeptical Science website provides clear answers to common questions and misunderstandings about climate change. What's Really Warming the World? - This animated graphic compares different forcings that are acting on Earth's climate. Climatic changes caused by orbital variation, the sun's luminosity, and volcanic emissions are compared with the effect of greenhouse emissions. The graphic is very engaging and the data is from NASA's Goddard Institute for Space Studies (GISS).